Above: Sabah, from Istanbul, Turkey. 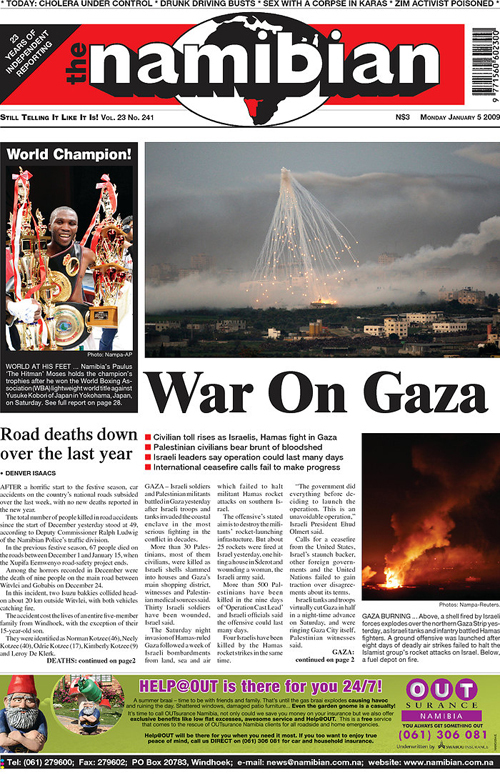 Many newspapers chose to focus on these horrifying images of white phosphorous explosives in use over Gaza yesterday as the ground offensive began. 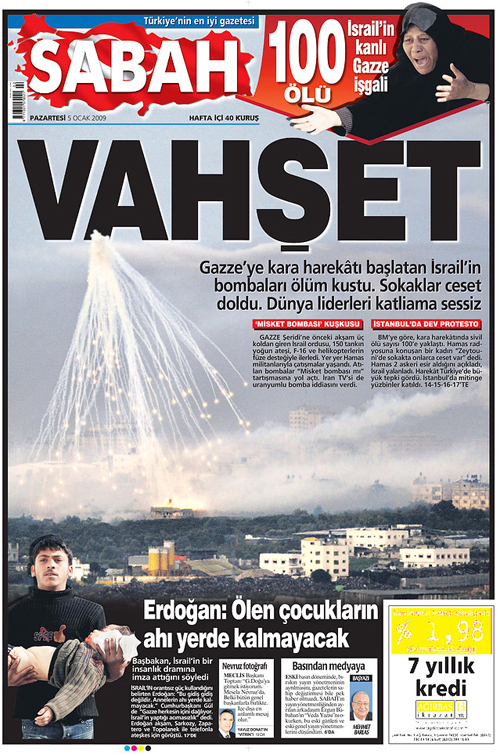 In stark contrast, even acknowledged liberal Israeli papers like Haaretz focus almost exclusively on relatively insular images (see below). focus on the immediate and desperate human image, people caught between the madmen on both sides. 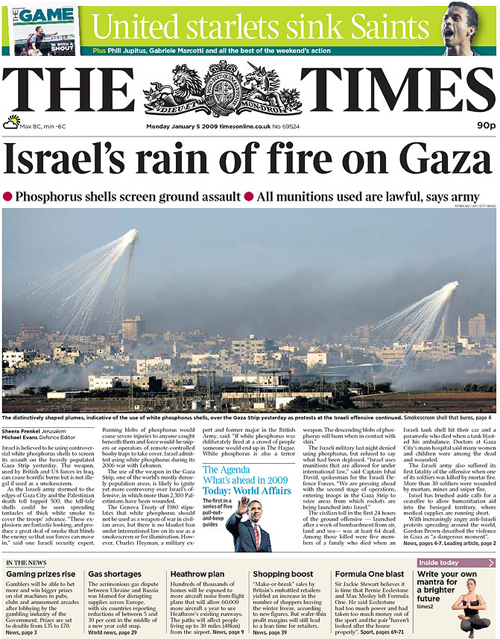 Above: The Times, London, UK. 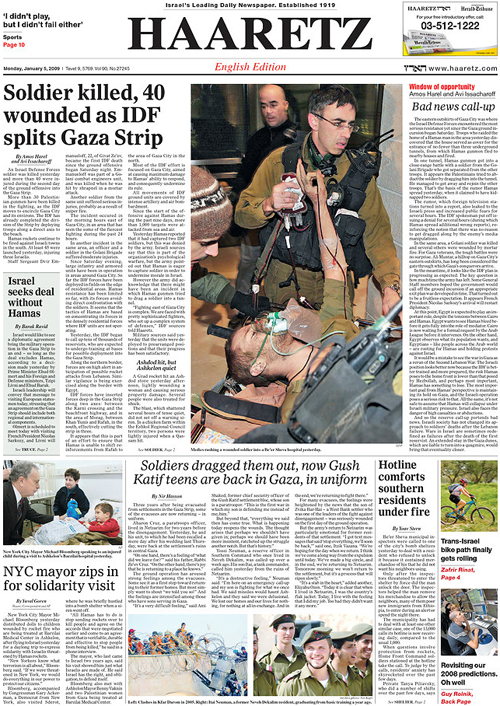 Above: Haaretz, English edition. 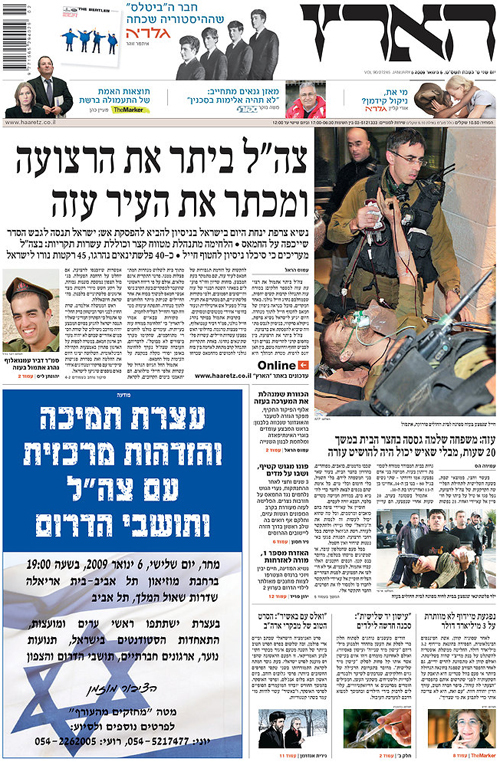 Note the story on settlers that had recently been removed by the IDF, but who are now serving in the IDF. 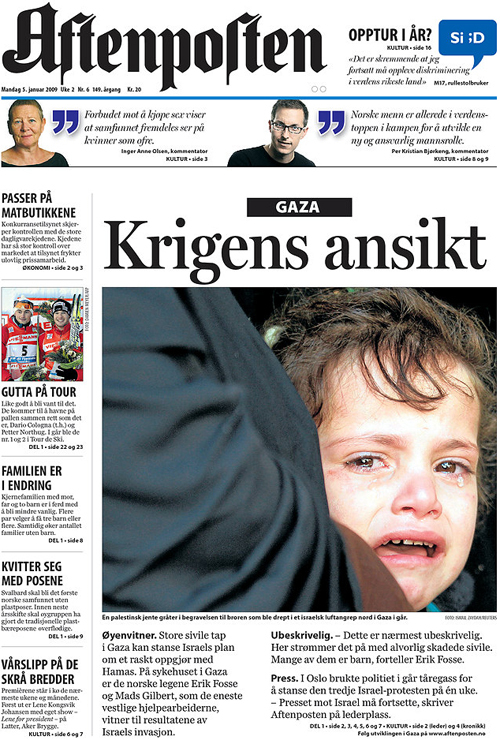 Above: Asharq Al-Awsat, this paper is published in London (UK). 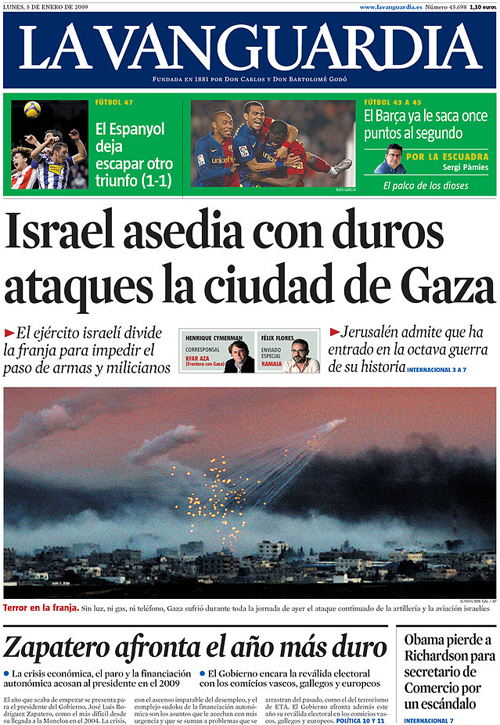 Above: La Vanguardia, Barcelona, Spain. 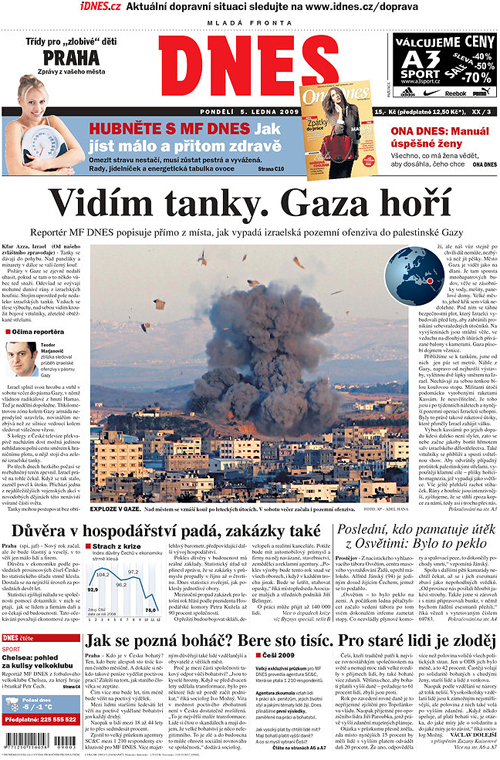 Above: Haaretz, Hebrew edition. Note the Fab Four beside the masthead. Above: The Namibian, Windhoek, Namibia. 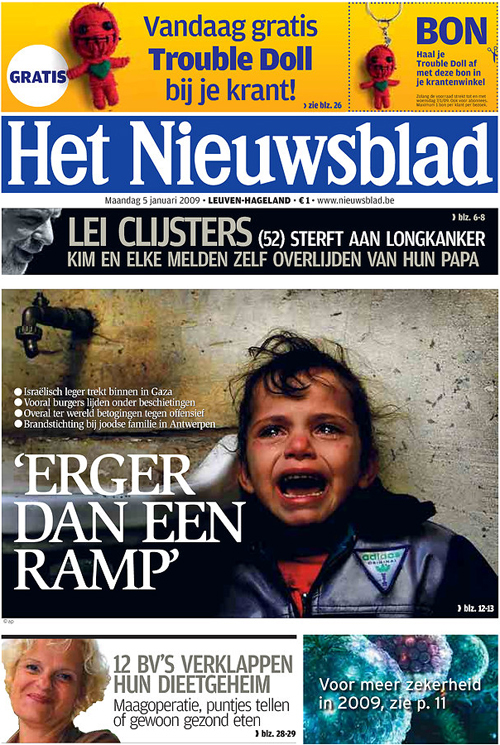 Above: Het Nieuwsblad, Brussels, Belgium. Above: Diário do Comércio, Sao Paulo, Brazil. Above: DNES, Prague, Czech Republic. As of 09:30 on January 5th, the numbers are so lopsided it is impossible to understand. The world begged India to show restraint after the Mumbai attacks, surely the people of Israel must realize that, though they were provoked, this is a monumentally unbalanced response at the very least, horrifyingly arrogant and murderous at worst. Geotypografika déclare! All warmongering motherfu*kers on both sides need to be silenced, forced to wear exotic lingerie, and fight in a field of flowers with their bare hands, if they must fight. y’all warmongering motherfu*kers need to come out of the closet and embrace one another! Get some MGMT in your life, Time to Pretend. Above: Splash-page of the aforementioned banal and unreasoned response love reference 001! If you can stand it, follow more via a live-blog from the Guardian. More via a recent Google News Alert, Stephen Lendman lists many human-rights groups that have registered protests over the current war. Peace for the world, now. Previous: How Lovely the Leaves that Fall. 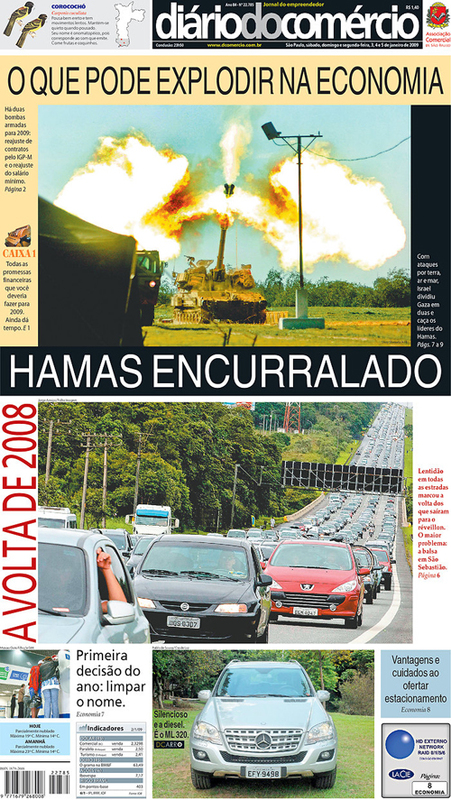 This entry was posted by Erik Brandt on Monday, January 5th, 2009 at 11:35 AM	and is filed under Aktuell, Education, Globalization, Graphic Design, International, News Links, Newspaper Front Pages, Typografika.